"One of the themes we were really interested in examining was the notion of impact," says coexecutive producer Joel Wyman. "What would happen if you just disappeared? If you didn't exist? What about the people in your life? What about the great things that you've taught others and the great things they've taught you? And how you've changed their lives and they've changed yours?" As fans ready for season four's second episode Thursday at 9 p.m., not even Jackson knows the answer to those questions - or the biggest X-File: when he'll be back. "To a certain extent, Peter is the MacGuffin of the show," Jackson told The News. "So we have this ensemble cast, and he's the guy who lots of things are about, but who doesn't get to do a lot of things. That's who he is, that's what the character is, so I can get frustrated all I like, but it's not going to change. "I'm curious to see how I hopefully get integrated into the show." Until then, Jackson will have to watch from the bench as his fellow actors get more time to act alongside themselves. Season four opened with the counterparts of both alternate universes - in particular Torv's Olivia and "Fauxlivia" - having to grudgingly work together not long after their Earths were on the verge of merging into each other and wiping out at least one of them. "I thank the studio and the network and the writers for not just giving a little taste of this alternate universe where you're like, 'I'm not going to invest [in these alternate characters] because there's enough time,'" Torv told reporters at Comic Con. "Here we are at the end of season three and we're still playing with them." 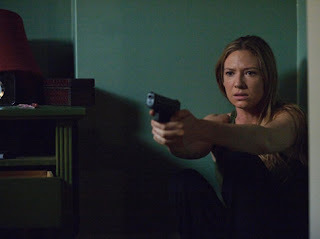 Torv gets to play some more in Thursday's episode - about a serial killer who snatches his victims' memories, a case that brings both Olivias together in pursuit. Co-executive producer Jeff Pinker says nowadays it isn't too hard from a technical standpoint to shoot sequences that feature two Torvs. The show employs a camera attachment called a "repeatable head" that is used to create two versions of the same footage. "Essentially what we do is we shoot the exact scene twice," says Pinker. "The challenge is for Anna who is literally acting with herself twice." As much fun as they're having with their repeatable head, the producers vow they'll eventually return to the original dynamics that first made the show a critical darling and cult favorite. "We pay Joshua Jackson far too much money to have him sitting at home," says Pinker, laughing. "As much fun as they're having with their repeatable head, the producers vow they'll eventually return to the original dynamics that first made the show a critical darling and cult favorite." That means Peter and Olivia will get together again, right? That article is bordering on sensationalist, but other than one detail or two, it's far from nonsense. Half serious question for the shippers, how do you pair up a plot device with a perfect heroine? I think it will take a few hammers and a bulldozer. Question: If the stories tend to keep the characters apart, if they do come together, will it be the end of the show? Ever since they said "reset" I've had it in my mind that it'll probably take them the next two seasons (4&5 if we're luck, just 4 if we're not) to get back to the place they were in last season's finale as Peter entered the machine. It would be the perfect closure for that aspect of the show. So yeah, IMO They'll be together, just not as fast as we might want. i was wondering how they bring Peter back! !